Dr. Copper: We need the Fed to aggressively ease monetary policy. Mr. Gold: I don’t know what you are talking about, they should raise rates now. Dr. Copper: But NGDP has only increased 4% in three years; normally it would rise at least 15% over that time span. Mr. Gold: But the Fed’s mandate isn’t NGDP, it’s an inflation targeter. Dr. Copper: Actually, its mandate is stable prices and high employment. Unemployment is 9.1%. Mr. Gold. But we all know the Fed can’t target employment in the long run, better to focus on 2% inflation. Dr. Copper: But core inflation has been below 2% in recent years. Mr. Gold: People can’t live without food and oil, who cares about core inflation? Dr. Copper: But even headline inflation has averaged only about 1% in the past three years. Mr. Gold: It’s not the past that’s important, it’s the future, and inflation is rising sharply. Dr. Copper: But the TIPS markets say even headline inflation will be under 1.5% over the next five years. Mr. Gold: Don’t you understand; these low interest rates will create another asset price bubble, just like in 2003-06. Dr. Copper. Oh, so you do favor looking at asset prices. I thought you wanted a single mandate; headline inflation. Mr. Gold: Well . . . consumer inflation is important, but asset prices should be part of the index. Dr. Copper: But housing prices are down 32%, and still falling. So if we added assets to the CPI wouldn’t it show deflation? Or do you just favor paying attention to asset prices when they are high? Mr. Gold: Face it; you are just trying to bail out irresponsible borrowers. Dr. Copper: That’s not true, but would it be so bad if the debt crisis was lessened as a side effect of monetary stimulus? Mr. Gold: The Fed should not be adding to moral hazard, they need to focus like a laser on price stability. Dr. Copper: But didn’t they bail out the big banks in 2008? Why not a little help for middle class homeowners? Mr. Gold: Because they aren’t too big to fail. Dr. Copper: But isn’t there evidence the entire world economy is headed for a slump? Michael Darda predicts Europe’s NGDP will decline in 2012. China is slowing rapidly. US personal income growth has now turned negative. Japan is still in deflation. Aren’t you worried? Mr. Gold: Yes, but countries like Australia are still doing quite well. Mr. Gold: Pffft. Copper is what pennies and farthings are made out of; gold is the metal of crowns and guineas. Dr. Copper: But even gold prices have plunged nearly $300 dollars in recent weeks!! Mr. Gold: Well why didn’t you say so; fire up the helicopters. Update: Johnleemk created this animated version of the conversation. This entry was posted on September 30th, 2011 and is filed under Inflation, Monetary Policy, NGDP targeting. You can follow any responses to this entry through the RSS 2.0 feed. You can leave a response or Trackback from your own site. It’s good to know that he and Evans are at least there talking in Bernanke’s year. Also Hoening is leaving soon too. During 1H2008 and 1H2011 when commodity prices were spiking, commodity price signals were mostly a communicating the unexpected strength of real China growth. During 2H2008 and 2H2011 when commodity prices were/are sinking, those same signals were/are mostly communicating the stance of Fed policy. Like I said, I get that you are making a cute post here and have to incorporate a lot of people into “Mr. Gold,” but I’m just pointing out that some of your fiercest critics aren’t as flat-footed as he is. Liberal Roman, That’s good to hear. David, Yes, and we know that because NGDP was weak in the first halves of 2008 and 2011. So it had to be China. Bob, I wasn’t aiming this at Austrians per se, but rather inflation hawks. I get lots of people objecting to a focus on unemployment, they tell me the Fed should just focus solely on price stability. That’s essentially what Dallas Fed President Fisher said the other day, isn’t it? OK, then asset bubbles don’t matter. Then there is a different group that says the Fed should have stopped the asset bubble. OK, if they target asset prices doesn’t a 32% fall in home prices, and still falling, suggest easier money is needed? But I rarely see those who complained the Fed should have lowered housing prices in 2006, now say they should try to raise them. Certainly no one person could be expected to make all the fallacious arguments that Mr. Gold made, that would not be humanly possible. Rather I was reacting to many commenters I’ve addressed over the years, who have expressed hawkish views for a variety of reasons. It’s a composite. BTW, those who advocated bailouts of the big banks were meant to be hawkish “Very Serious People” within the Fed. I realize Austrians are more populist and correctly criticized the bailouts. Perhaps the composite should have been called Mr. Hawk, as I wasn’t really focusing just on gold bugs–rather I was trying to be clever with that name. As you know Dr. Copper has become a popular symbol in the commodity markets–I needed a foil. I know you could do this exercise much better than I can, and make me look foolish. I just pray that you don’t. What Fisher said is that it is OBVIOUS to people who know and people who matter that the government needs to be put into a box, before we can expect the economy to grow. We know it like we know the sun rises in the morning. SO, any printing now would just be papering over, aiding and abetting bad economics. Please learn to argue against the real point your opposition makes. This is a profound teachable moment… Obama should have made like Clinton. And by Dec 2012, that will be the gospel preached by every Dem operative America. We might go another 40 years before the Dems have the nuts to run a progressive for office. You cannot argue with results. No matter what we have done, the outcome has been a far more conservative America. I would ask if you derive a useful signal about Fed policy from commodity price changes. If one interprets those changes only in light of NGDP movements, then the “signal” is not independent but redundant. BTW, on the subject of signals, “Mr. Gold”, the longest duration asset extant, responds to the trajectory of future inflation. Empirical evidence shows that one possible trajectory of high and variable inflation involves, as a precondition, the permanent monetization of high fiscal deficits. Ask yourself, is attaining this precondition more likely in 2011 than it was in 2001? And more likely in September, 2011 than August, 2010? I think the gold price reflects the answers to those two questions. Every time DeKrugman comes closest to making his “bigger” point, his gaping invadable backside winks like the giant maw of the incompetent he claims to care about. DeKrugman was smart enough to not commit to “it will work” when quizzed about the stimulus. I HAVE BEEN RIGHT ALL ALONG. I say public employees shouldn’t be making a dime over what they made in 1998 with inflation. Their productivity gains should have covered any increase in wages, because there would be LESS of them getting more done. SINCE that didn’t happen, the Very Serious Person that DeKrugman must bow down to is me. My numbers don’t lie: keep the public employees at 1998 levels with inflation and you get SEVEN TRILLION unspent. $7,000,000,0000,000 WASTED on public employees. There is a BASIC UNDENIABLE FACT: public employees can never have boom times, when revenues are up, they get nothing extra to self insure against being fired when things go sideways. When they pushed for pay raises they signed their own death warrant. Bye Bye Public Employee Unions! Bye, Bye DeKrugman! Ugh, yes I want more inflation. No, I refuse to buy into the statement that the Fed is failing its mandate by letting inflation drop below one-percent. Yes you can draw a line through a short period and find something that looks like a two-percent target. Yes, that is the ECB target, but look longer and what you see is a long term trend of falling inflation. Why is it falling? Well its plausible the mandate means two-percent; its also plausible the mandate means zero-percent, or falling toward zero, or any other combination of trend. Its vague but okay okay, and when the bill was drafted “stable meant zero” but employment conjunct was some kind of Philips curve nonsense. The legalese of the mandate is a thin reed. Hanging your hat there makes you seem dogmatic. Okay what about the full employment part of the mandate? Again, it was drafted as part of that old Philips curve saw. So how do we know full employment when we see it under that meme? Well, when there is slack in the labor market, we are not there–stimulus produces no inflation, if there is no slack, we are full-employment. Well, the Fed has tried a few experiments, inflation has always picked-up, unemployment held steady, ergo there is no slack. Ergo we are at full employment in the sense of the time at which the langage was drafted. Don’t like that argument? Again, the legalese is a thin reed. Focusing on it–rather than the utilitarian argument. I don’t think anyone can concretely say what it is that ‘mandate’ means. If the mandate said, keep surprising the market with how much deflation you can make, we’d be right to cheer when the mandate had no operative effective. Want to pick on something? Pick on the fact that IOR was sold to congress as a tool to eliminate the TAX of banks having to hold reserves. That sure isn’t how its being used. When was the last time you heard about a congressman discussion deauthorizing IOR? Never. That’s something concrete we can fight over. Bernanke said on wednesday that unemployment is a national crisis, and Congress should do something about it. The chutzpah it took for him to make that statement is incredible. How about a mea culpa for overforecasting growth, inflation 50% below “target” for the last three years, and a do-nothing FOMC? monetary policy is not a panacea … because it has not been tried. Morgan, When I see the small government I’ll believe it. David#1: There is some correlation between commodity prices and Fed policy, but Asian demand has made it weaker. David#2: I disagree. I see high gold prices reflecting low real interest rates plus Asian demand. I don’t see high inflation expectations. Bob, Yes, I agree with that. My satire only works if readers have a sense of recognition in reading the statements. I’ll let others decide if it works. Jon, Good point about the IOR. The assumption of the 2% target comes from that fact that most Fed officials forecast 2% long run inflation. dwb, I thought that Bernanke statement was quite interesting as well. We should have RIPPED OFF the bandaid on housing prices, and done everything possible including raising rates TO FIND A BOTTOM. While you invent reasons for a “housing shortage” what we are doing is moving back to the lower homes ownership rates we ALWAYS should have had. Housing is not an investment. In 2008, we should have ANNOUNCED housing is not an investment, and that we expect to see prices fall to their 2000 levels. Blown the banks to smithereens, and given the winners their prize. Is the possibility of future deficit monetization higher or lower today than in 2001 or 2010? I said nothing about current inflation expectations. In fact, the lower these go, the higher the chances for the deficit monetization precondition to be met. This is not a complicated construct. We have seen the dynamic is many, many countries that try to avoid painful adjustment through permanent “stimulus”. I agree real rates are a big factor. They are an effect of defacto monetization. That is, when the Fed finances fiscal deficits, it does so at negative real rates (why else have the Fed do it?). Right now, total credit is not growing so there is no demand for additional bank reserves. That will change as private credit stabilizes at low levels and government credit continues to grow by 8-12% of GDP a year. At that point, we will see high and variable inflation. Again, this dynamic has been seen in many countries. Morgan, your claim is based on faulty data. 1) House prices ARE ALREADY AT 2000 levels. 2) Your survey was for how long it would take for housing to recover to 2007 levels. No one is asking for that, but they are asking for housing prices to stabilize. The survey also shows significant disagreement and uncertainty. Aside from your anatomical obsessions, I’m not sure you’ve posted anything useful, other than the typical “give all your hard assets to the Tea Party and we’ll let you restore nominal growth” argument. Scott, the argument made by the gold bugs is that FUTURE inflation is inevitable due to increasing debt loads. I actually agree – in trying to prevent inflation NOW, we are hobbling growth to such a degree and increasing public debt so much that we are increasing the likelihood of substantial future inflation. The future impact of monetary policy on the relative price of assets is clear if you look at it historically. It’s noteworthy that gold increases in relative price during monetary contractions, NOT monetary expansions. 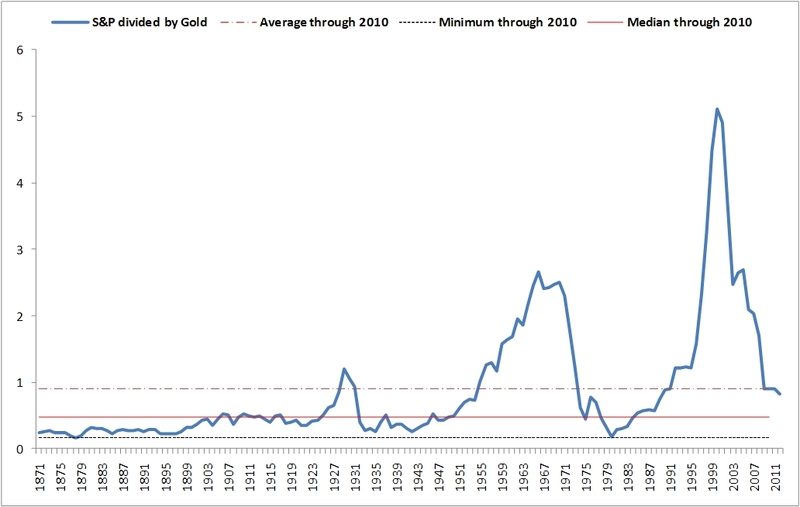 Demand for gold, in so far as it is a function of fear of other assets, belies the notion that gold likes printing. Over the past 3 months, gold has reacted NEGATIVELY to announcements of monetary easing, and moved inversely to stocks, except most recently when stocks and gold resumed correlation (and the only rising asset has been the dollar and dollar denominated debt). Financially, assets might well be fairly priced right now – housing, gold, stocks – all are close to long term averages. However, trends are funny things, and policy is certainly very strange. What gold owners fail to realize is that gold prices – like others – respond to substitution and income effects. The substitution effect usually dominates. If inflation increases modestly, and this leads a real decrease in debt values and increase in demand, the impact on discounted nominal cash flows for stocks is substantial, which draws investments away from gold at a faster rate than inflation pushes wealth into gold. This post puts the following in perspective: was America better off in July 2008 with $147/bbl. crude, 5.8% unemployment and nominal personal income in line with its 1990-2007 trendline or six months later with crude at $35/bbl., unemployment on its way to double digits and income set to collapse 13% below trend? I’ll take expensive oil against that alternative any day of the week. Not that I believe the Fed is the primary driver of commodity prices in a world with China compounding NGDP at 15% per annum. But still……. I’m told, we’re very close to seeing a bottom, it’s just not going to increase and as such there will continue to be folks who have been holding on who finally let go. Frankly, I have never understood the desire to save those in foreclosure. Those who have their mortgage paid off, no worries. Those who have no equity, no worries. And there ARE NOT any folks who have purchased say after 2002, and have built up a bunch of equity. So folks who bought before the spike, and didn’t refi, they have been making and continue to make low payments – same as it always was. So it’s like there not really ANYBODY to save. So has Dr. Copper finally wrestled Mr. Gold into the dust? I think so myself. Dr. Copper has been hitting the weights lately and he’s mighty pissed off. Morgan, “Data,” or a forecast? That’s an implicit forecast of near-zero NGDP growth, in which case the Perry presidency will be a big failure. David, I don’t follow your argument. Fears of debt monetization (which may be higher today) don’t affect gold prices unless they increase inflation expectations. And they haven’t increased inflation expectations. Thirty year inflation expectations are lower than in 2000. This is based on a common misconception, the Fed is not printing money, they are not monetizing debts. Low real interest rates are actually caused by the weak economy, plus high Asian saving rates. We will not see high and variable inflation, as the Japan example shows. Statsguy, See my answer to David, investors don’t expect future inflation. I’m not totally convinced by your tight money argument. Gold prices rose sharply in the 1970s on easy money, and fell in the 1980s on tighter money. Mark, Copper has the much stronger argument, but can he win at the FOMC? I can’t wait until the three hawks leave. Bonnie, Thanks for the info. anon, I believe alternative currencies are legal in the US. They obviously can’t call themselves “dollars”, as that would be counterfeiting. As an analogy, alternative operating systems are legal in the US, as long as they don’t call themselves “Windows.” Please correct me if I am mistaken. The main explanation for the TIPS/Gold divergence has to do with option values. The 30-yr TIPS has an imbedded put option on outright deflation in the CPI. That put option value raises the real interest rate component of TIPS and reduces the inflation expectations component. Thus, the broader the expected range of future inflation (the fatter the tails), the more TIPS and gold will exhibit opposing signals. A second explanation requires a relaxation of EMH. TIPS are also highly inefficient from a tax standpoint. Depending on the degree of market efficiency, this could also constrain its use as a l.t. hedge. Lastly, the value of the TIPS inflation call option on inflation depends on the government’s credibility, and it is exactly that credibility that falls into question when people fear high and variable inflation. Perry et al will rip off the bandaid, he’ll make sure the foreclosed lose their houses and that the inventory hits the streets. All kinds of forecasts change when we become positive Obama is gone. the question is when your own identity has to make a call. I’m looking forward to that. It’s hopefully catchier than the pop Austrianism which has dominated the videos in this genre. Scott, there’s a disconnect there we need to explain. 1) If high gold price is caused by loose money, then why is TIPS spread so compressed? It means one of two things: There’s a MASSIVE failure to arbitrage, or the link is incomplete. I suggest incomplete, but then why? One possibility is duration – average TIPS duration is about 10 years, and let’s say that inflation is expected to begin in year 8 (after 5 years of deflation). Or, let’s say we have no idea when inflation will begin (look at japan), but it MUST begin sometime (we think) because of massive government debt. Tips could remain quite low. Gold, btw, is also a hedge against sovereign default. Note that gold really started to spike in the US debt debates. My interpretation of this is that markets anticipated that US debt would, in the worst case scenario, be monetized. Suddenly, the markets realized that a technical default WAS possible due to gridlock, and that the powers-that-be might even permit it. In any case, look back at the chart – gold, priced in stocks, started falling in 1980. David, The TIPS spread would be even smaller if TIPS prices could fall below par. So I think you have things backward. Even if one ignores the TIPS, the T-bond market clearly shows inflation expectations are quite low. People would demand higher bond prices if they feared inflation and/or default. Morgan, I doubt he does that. Johnleemk, Thanks, I added a link. Statsguy, See my answer to David. 30 year bond yields wouldn’t be ultra low if people feared inflation and/or default. We don’t have 50 year bonds, but I’m sure their yields would also be low right now. The value of any embedded option in a fixed income security is incorporated into its yield. In this case, the value of the inflation “put” forms part of the TIPS real yield. I’m late as usual, sorry. Gold prices are reputed by many to be inversely related to real interest rates (some say short rates, others say long rates) given that the opportunity cost of holding gold is foregone interest. If QE3 were to raise NGDP expectations and thus also real interest rates (a la Scott Sumner) including, one assumes, those at the short end, why would it be expected that QE3 would have an unambiguously positive effect on gold prices? Never mind the above: you are right; the real interest rate should be lower to reflect the value of the put, not higher. David, I’m actually not sure it would. The last line was sort of a joke. Many inflation hawks view high gold prices as a sign of inflation. So I thought I’d suggest that falling gold prices (by that logic) might be a sign of disinflation.